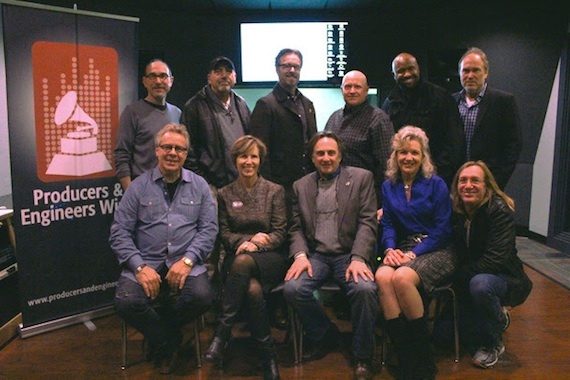 Leading members of The Recording Academy Nashville Chapter Producers & Engineers Wing committee, along with representatives from the Harman Professional brands AKG, JBL and Lexicon, recently hosted “Listen Up,” a series of seminars and workshops at Nashville’s Pearl-Cohn Entertainment Magnet High School. Among those taking part were Nick Palladino, Jeff Balding, Julian King, Shannon Sanders, Ben Fowler, Lisa Harless, and Chuck Ainlay. The event was aimed at the school’s students, who benefit from a world-class on-campus recording studio, opened nearly one year ago and developed by members of the P&E Wing and others as part of Nashville’s “Music Makes Us” educational initiative. The student events were followed by a P&E Wing membership event and social mixer that evening.